Comm Eye Health Vol. 30 No. 98 2017 pp 33. Published online 07 September 2017. Ready-made spectacles are suitable for a high proportion of children with refractive errors – but not everyone can benefit. The most common means of correcting refractive errors is with spectacles. Spectacles are prescribed and dispensed with corrective lenses that give the best visual acuity and are comfortable. Custom-made spectacles (i.e., made up for each individual) are more expensive, but they are essential in some cases, i.e., when a person requires astigmatic correction or needs different power lenses in each eye (anisometropia). A standard way to report refractive error is to use the ’spherical equivalent’, which is calculated as the sphere plus half the cylinder, in dioptres (for example, the spherical equivalent for a refractive error of +2.0D with a -1.0D cylinder is 2 + (-1.0/2) = 1.5D). In children who have no or low astigmatism, and only a small difference between the left and right eyes, their refractive error can be corrected using a pair of ready-made spectacles: low cost, high quality spectacles that have been pre-fitted with pairs of lenses of the same spherical equivalent. 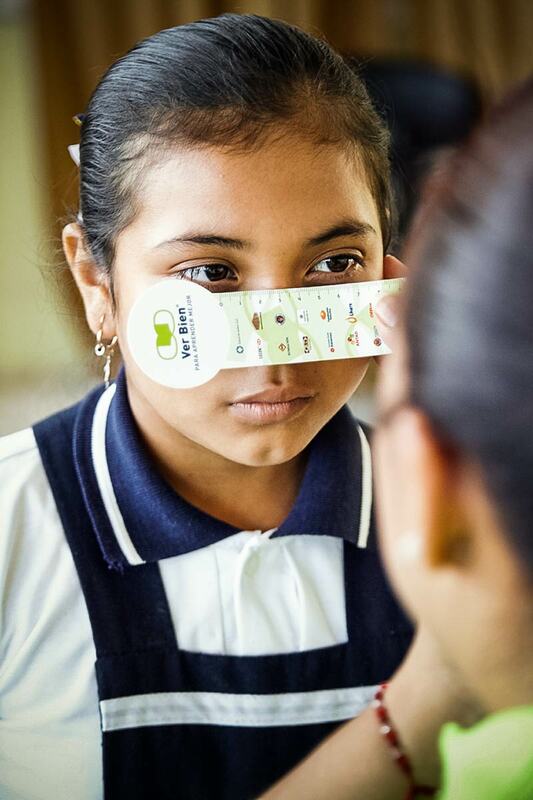 The advantage of ready-made spectacles is that they are less expensive, can be dispensed immediately in schools or clinics, and require less time to dispense. 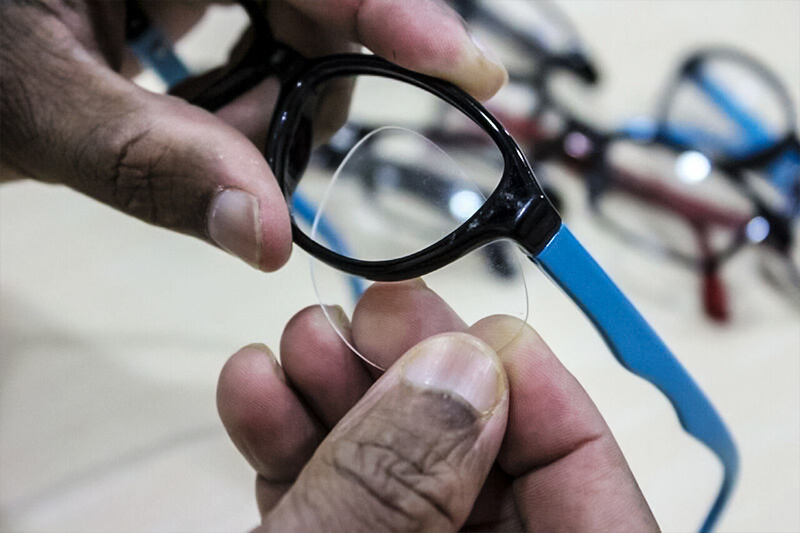 2.5 New Vision Generation, an Essilor Group initiative, has produced a range of spectacles called ‘Ready-to-Clip’ that allows on-the-spot delivery. The lenses, which are interchangeable between right and left, are clipped into the person’s chosen frame according to their individual prescription. Lenses of different powers can be used in each eye, which means that some children with anisometropia can also benefit. Inventory is also reduced. Despite the many advantages of ready-made spectacles, it is important to identify which children have refractive error needs that cannot be met by ready-made spectacles; these children need custom-made spectacles made up by a dispensing optician (Table 1). Those who prescribe and dispense spectacles must be trained to be able to distinguish which type of spectacles would be suitable for each child. Custom-made spectacles and ready-made spectacles should only be dispensed by a trained person, based on appropriate refractive technique, e.g., retinoscopy undertaken by a competent practitioner. All children who require spectacles must have their inter-pupillary distance measured to ensure the correct size spectacles are fitted (Figure 2). 2 Yangfa Zeng, Lisa Keay, Mingguang He, Jingcheng Mai, Beatriz Munoz, Christopher Brady, David S. Friedman, A Randomized. Clinical Trial Evaluating Ready-Made and Custom Spectacles Delivered Via a School-Based Screening Program in China, Ophthalmology, Volume 116, Issue 10, October 2009, Pages 1839-1845.